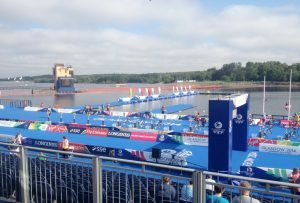 As part of the 2014 Commonwealth Games in Glasgow, the swimming leg of the triathlon events were planned to take part in the city’s Strathclyde Loch. APEM and our partners used innovative techniques and new research to ensure that the water quality within the loch was safe for the athletes. Strathclyde Loch is a man-made loch approximately one square kilometre in size and fed by the South Calder Water. 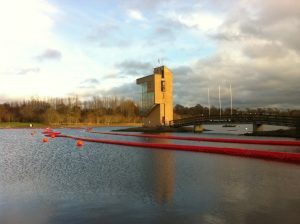 The loch, owned and operated by North Lanarkshire Council (NLC), is an important venue for amateur and professional water sports. However, the loch is adversely affected by elevated bacteriological (and possible viral) loads, as well as intermittent blooms of blue-green algae. These can cause significant health problems for humans. This has forced the suspension of water-based activities at times in the past. A plan was therefore implemented to improve water quality in time for the 2014 Commonwealth Games, and to ensure that the loch continued to be viable for recreation following the games. APEM was commissioned in 2012 by the Scottish and Northern Ireland Forum for Environmental Research (Sniffer) and North Lanarkshire Council to help to deliver the Strathclyde Loch Restoration Project. The key aims were to improve the water quality in time for the games, improve the ecological condition of the loch and deliver long term improvements to benefit the recreational value of the loch. Throughout the project APEM formed an integral part of the technical advisory group. We worked closely with partners including NLC, SEPA, CREM, ACE, the Scottish government, Sniffer and Scottish Water. In the project’s first phase APEM collected extensive data and carried out a review of relevant literature in order to understand the loch’s existing water quality and catchment pressures. Data were analysed to determine the site’s current and historic condition and any gaps that might affect attainment of project outcomes. Causes of the adverse water quality were identified and included catchment sources, diffuse and point source pollution, and internal loading. A number of short and long term restoration options were then assessed. These included: water level manipulation, inflow deflection, temporary isolation, application of phosphorus binding agents, sediment dredging, destratification, hydrogen peroxide dosing, ultrasonic treatment, shading with bird balls and aquatic dyes, filtration and clarification of loch water, barley straw, UV disinfection and chemical disinfection. Long term management options were also identified. These involved control of diffuse and point source pollution, increased flushing of the loch, isolating the loch from the South Calder Water, constructed wetlands and biomanipulation. Phase two of the project involved the implementation of a number of the short term options identified in phase one. These included the installation of a series of impermeable barriers to create a swim area, chemical dosing to reduce the levels of phosphorus in the water and hydrogen peroxide dosing to control blue-green algae blooms under licence conditions from SEPA . Artificial barriers were used to isolate an area of water at the southern end of the loch from the remainder of the loch. This closed area would be used during the Commonwealth Games. The barriers would prevent replenishment of nutrient loads and faecal indicator organisms (FIO) into the swim area from catchment sources. It would also reduce the surface area and volume of water that would require treatment if any water quality problems were encountered in the lead-up to the games. Within the swim area several techniques were used to reduce the likelihood of blooms of harmful blue-green algae. 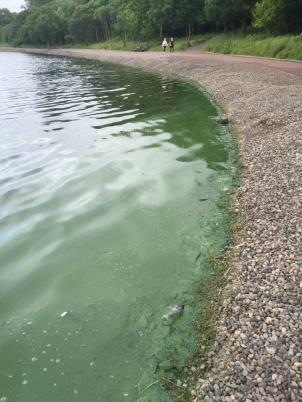 Within the swim area several chemical applications were used to reduce the likelihood of blooms of harmful blue-green algae. This included application of Phoslock, a phosphorus binding agent. Phoslock was used to reduce the concentration of phosphorus in the water and thereby reduce the growth of blue-green algae. 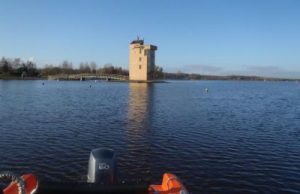 The success of the Strathclyde Loch restoration project in meeting the deadlines and water quality guidelines required by the 2014 Commonwealth Games was clearly demonstrated by the successful completion of the swim events in July 2014. 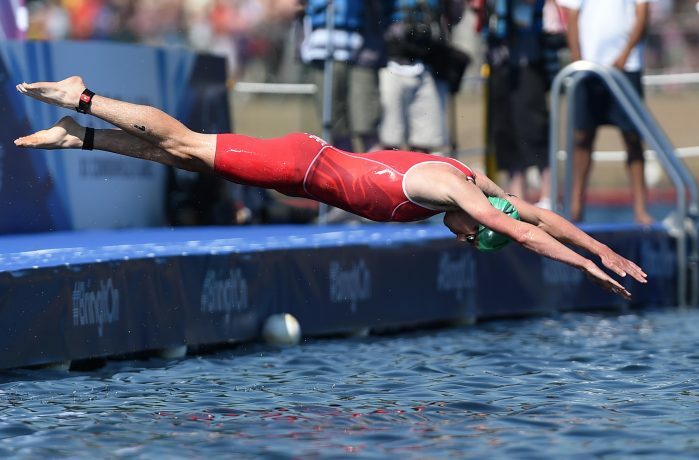 All water quality parameters were well within the guidelines set by the International Triathlon Union (ITU). In the run up to the games APEM continually reviewed chemical and biological data for the site, collected by NLC, SEPA and APEM, to ensure the swim enclosure remained compliant with the standards required by the ITU. The data clearly indicate that the baffle curtains had the desired effect, isolating the swim area from the major source of pollution inputs to the loch. This was demonstrated by a marked reduction in FIO concentrations within the swim enclosure. Even when a bloom of blue-green algae occurred in the loch outside the swim area in June 2014, levels within the swim area remained low. The effectiveness of hydrogen peroxide dosing in rapidly reducing blue-green algae densities was clearly demonstrated. Levels fell by 80-85 per cent within 24 hours and by 97 per cent within four days. The trials and experiments undertaken were invaluable in informing any future dosing of the loch. A swim area isolated from the main loch remains, although this is much smaller than the area isolated for the games. The project now also holds a licence for the application of hydrogen peroxide within the isolated ‘Strathclyde Loch Swim Area’ to manage blue-green algae. In the run up to several events in summer 2016 APEM was commissioned to dose hydrogen peroxide into the swim area to treat blooms of blue-green algae. APEM undertook the dosing and pre- and post- dose monitoring of algae, macroinvertebrates, zooplankton and chlorophyll. Algal data indicated up to a 93 per cent reduction in cell densities after dosing, allowing the events to proceed.